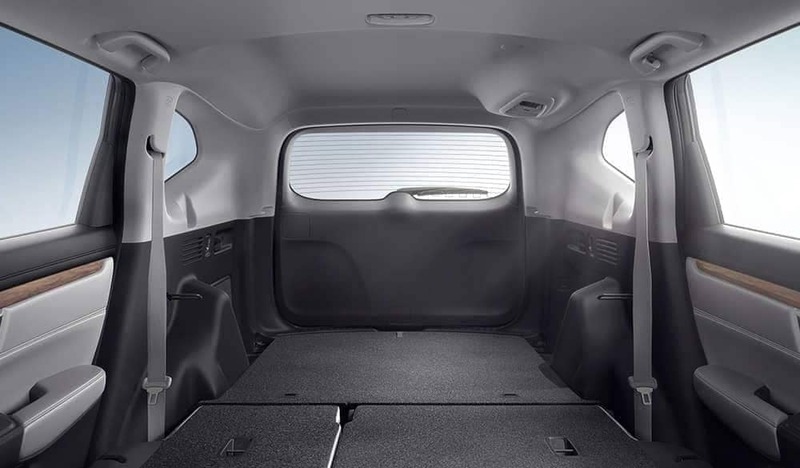 2019 Honda CR-V cargo space outpaces the competition to provide full-sized storage space within the sleek and modern body of a class-leading compact SUV. 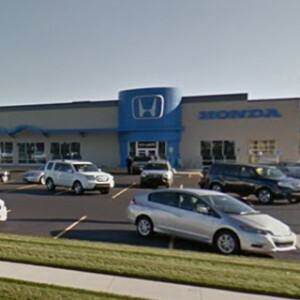 It’s available now from your local Mid-Michigan Honda dealer, so feel free to visit if you’d like to check out everything from Honda CR-V cargo accessories to interior dimensions. Before you take a look in the flesh, read on to find out what you can expect. 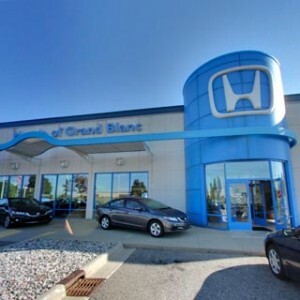 As noted by The Car Connection: “Great passenger space and a roomy, accessible cargo hold make the 2019 Honda CR-V an excellent crossover SUV choice.” Whether by a little or by a lot, the Honda CR-V’s interior space is the envy of rival compact SUV models. Toyota RAV4: Up to 37.6 cubic feet behind the 2nd row and 69.8 behind the 1st row. Nissan Rogue: Up to 39.3 cubic feet behind the 2nd row and 70 behind the 1st row. Ford Escape: Up to 34 cubic feet behind the 2nd row and 68 behind the 1st row. Mazda CX-5: Up to 30.9 cubic feet behind the 2nd row and 59.6 behind the 1st row. Hyundai Santa Fe: Up to 35.9 cubic feet behind the 2nd row and 71.3 behind the 1st row. 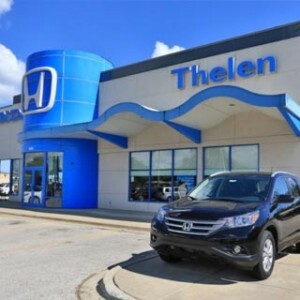 The Honda CR-V features an Easy Fold-Down 60/40 Split Rear Seat across all trim levels to change between interior configurations in a flash, and the vehicle offers a low load floor to make loading and unloading heavier items that much easier. Hidden Storage Compartment: Pull up the carpeted floor panel to find a more secure space for valuables. Cargo Area Tie-Down Anchors: When you have to stow something heavy, secure it with tie-down anchors to prevent movement. Cargo Area Lights: Provides handy illumination when you need to load in the dark or find something in your cargo area. Retractable Cargo Area Cover: Once pulled down, the cover keeps any items in your cargo area from prying eyes. Hands-Free Access Power Tailgate: With the key fob about your person, simply pass your foot beneath the rear bumper to have the tailgate open automatically. 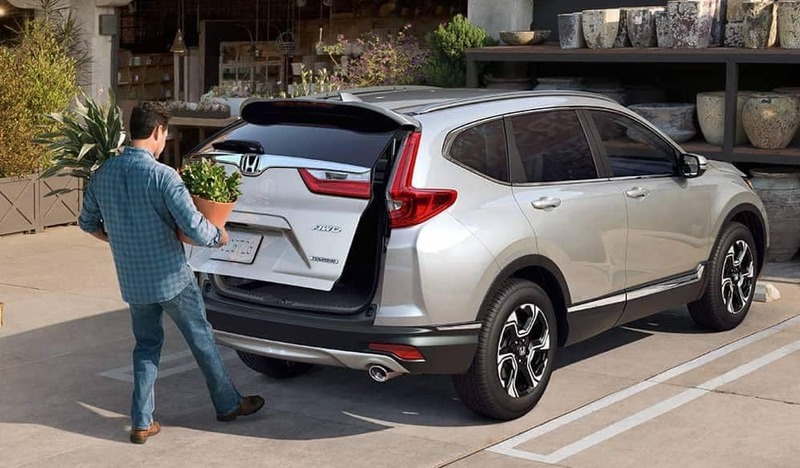 The Honda CR-V allows you to further personalize and perfect your cargo area with several cargo accessories meant to enhance protection and convenience. 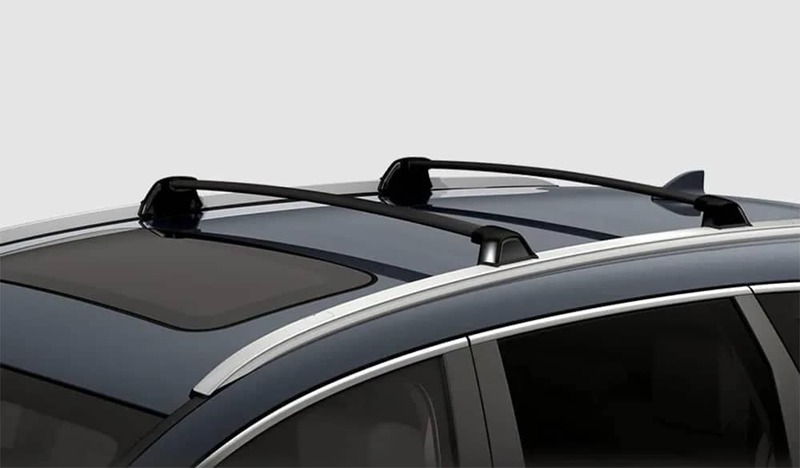 Cross Bars: Designed to fit with the Honda CR-V’s roof rails, cross bars boast a 165-lb maximum load capacity. Roof Box: Provides up to 13 cubic feet of lockable storage space with a rear opening for easy access and convenient 110-lb maximum-load capacity. Ski/Snowboard Attachment: Holds six pairs of skis or four snowboards securely in place and comes with oversized push buttons for easy operation while wearing winter gloves. Kayak Attachment: Use soft, adjustable saddles to firmly cradle your kayak, plus reinforcing straps and ratcheting tie-downs to secure it. Bike Attachment: No need to take your bike apart and put it back together when you want to take to the trail. The Honda CR-V can take two adult bikes up top. Surfboard Attachment: Holds two boards up to 34 inches wide. It can even double as a stand-up paddleboard holder. Tent: Sleeps 6 people in a 10 ft by 10 ft shelter that still provides full access to the vehicle and a 6 ft by 6 ft rainfly. 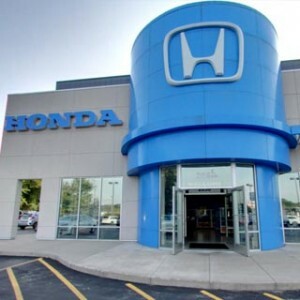 The Honda CR-V is one of our most popularAWD vehicles, and you can explore everything from interior dimensions to special offers at your nearest Honda dealer. 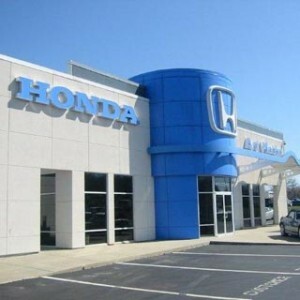 For any further advice or assistance, don’t hesitate to contact us today.